Falling short of a direct ban on the home and garden tool, lawmakers in the Senate passed a bill to include machetes within the definition of a deadly weapon. The measure, introduced in February, would make criminal possession of a machete a crime with a penalty of up to a year in prison. The bill passed the Senate Tuesday in a 54-5 vote and is now headed to the Assembly. Sponsors argue machetes should have been classified as a weapon long ago. “Despite the obvious serious injury that can be caused by the use of a machete, such weapons have not been included in the penal law’s definition of ‘deadly weapon,'” wrote Sen. Tony Avella, a Democrat from Queens, in a memo to lawmakers. 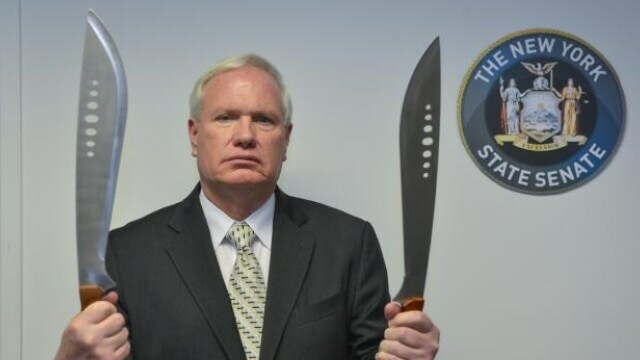 “This oversight is surprising given the common knowledge that machetes have often been used as weapons and are actually defined as such in Webster’s dictionary – ‘Machete – a large heavy knife used for cutting sugarcane and underbrush and as a weapon,'” said Avella. The bill, S.3199A, adds machetes to the list of deadly weapons in the state to include switchblade, gravity and ballistic knives, daggers, metal or plastic knuckles, and billy clubs and blackjacks. Possession of which would be a misdemeanor crime resulting in as much as a year in jail. Avella proposed a similar measure last year that failed to gain ground after a fatal machete attack on Long Island. Legal defense against possession charges of such “per se” weapons, in which the possessor has to show they did not intend to use it unlawfully, has led to multiple challenges in recent years. In one such case in 2015, an electrician charged with possession of what NYC police deemed a gravity knife won a $57,000 settlement when a court found the blade in question to be a utility knife used to strip insulation off wiring. Progress on the bill comes the same week New York City Mayor Bill de Blasio held up a drop in murders and shootings in the Big Apple, while admitting slashings and stabbings are on the rise. The number of knife attacks in the city for the first quarter of the year has increased by more than 20 percent to 899, compared with the same time last year, which saw 746 such assaults. “Stabbings and slashings aren’t going away,” Police Commissioner Bill Bratton said at the press conference, noting that such crimes are a “reality” of living in New York City. No direct mention was made by Bratton or de Blasio concerning machetes. Does the rig actually live up to its hype? Guns.com nabbed a Reckoning holster to find out.